Since the children have flesh and blood, he too shared in their humanity so that by his death he might break the power of him who holds the power of death—that is, the devil — and free those who all their lives were held in slavery by their fear of death….For this reason he had to be made like them, fully human in every way, in order that he might become a merciful and faithful high priest in service to God, and that he might make atonement for the sins of the people. Because he himself suffered when he was tempted, he is able to help those who are being tempted. Jean Dolores Schmidt takes her calling very seriously. You might know her, if you know her, from watching this year’s NCAA Men’s Basketball Tournament. 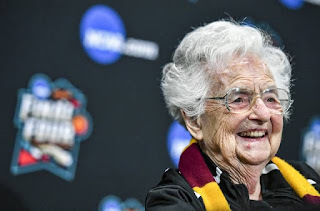 She’s Sister Jean there, the smiling little nun in the wheelchair on the Loyola University sidelines during their surprising run to the Final Four (at least). You might have heard that she’s the chaplain for the basketball team, and you may have heard one of her pre-game prayers/scouting reports. (“Lord, help our boys to not be afraid of Tennessee’s height, and help them to remember that there are more important things than height. And help them to remember that they’re vulnerable in the low post.”) It says something that casual fans probably could name her before Loyola’s head coach or best players. Sister Jean is certainly devoted to her calling as chaplain. She’s traveled with the team to every game during the tournament, age (98) and wheelchair (temporary, hopefully) notwithstanding. She prays with them, encourages them, and even does press conferences. Some fans have a little Sister Jean fatigue, and that’s understandable. But she’s been doing this for decades. And consider this: basketball chaplain is only one of her gigs. She also has another chaplain role that she takes just as seriously. She doesn’t get to do press conferences or go to basketball games in this role, but it's just as important to her. She’s also chaplain for a freshman dorm on the Loyola campus. She takes that role so seriously that she lives in the dorm. “He had to be made like them, fully human in every way,” the writer of Hebrews says of Jesus. “Since the children have flesh and blood, he too shared in their humanity.” Jesus said that he came to serve, not to be served. He came to give himself, not to receive the gifts of others. He came to live with us, even to share in our suffering. He moved in down the hall. He got to know our problems, didn’t get frustrated when we played the music too loud, and welcomed us knocking on the door at all hours of the night. He ate with us, showed patience with our pettiness, comforted us in our grief, and taught us that the thing we most feared was nothing to fear at all. Death roams free and unopposed among human beings. He takes no prisoners, offers no mercy, gives no quarter. And, left to ourselves, we're terrified of death. We hold it at arm’s length any way we can. We chase any imposter who claims to have a way to beat it. We cram experience after experience into our lives to create the illusion that death can’t touch us — or we live with regret that we couldn’t. We buy stuff and chase wealth and pleasure and prestige in the mistaken idea that by doing so we can fill the hollowed-out place that the fear of death leaves in us. And then when we can’t deny it — when it’s staring us in the face through the empty eyes of someone we love or breathing down our necks with every trip to the doctor, every candle on the cake, every new wrinkle or gray hair — when we can't deny it we collapse in paralysis, anger, and depression. Even those of us who say we aren’t scared of it are whistling past the graveyard, because we all can imagine a half-dozen deaths that do terrify us. One of the reasons that our culture loves superhero movies, I think, is because they provide an antidote to our fear of death. Superman is invulnerable to almost every kind of harm (and even comes back to life on those rare occasions when he is killed). Iron Man has his armor. Batman his gadgets. Thor and Wonder Woman are immortal, practically. Even the ones who can die are so powerful that death is rarely a likely outcome. And, even when it happens, it's almost never permanent. That's our answer to our fear of death: lose ourselves in a mythology in which our heroes defeat death time and again with power, intelligence, magic, or immortality. What believers celebrate this weekend, though, is that Jesus didn’t conquer death through any of those means. Though he might have wanted, like Luke Skywalker in The Last Jedi, to brush the cross off his shoulders like so much dust, he did the opposite. His death, the writer tells us, was to “break the power of him who holds the power of death—that is, the devil — and free those who all their lives were held in slavery by their fear of death.” In becoming fully human, and in suffering and dying as we do, he showed us without a doubt that God’s love and grace are stronger than death. Make no mistake: Jesus’ resurrection isn’t a bullet bouncing off the hero’s chest. It isn’t an immensely powerful superhuman making the claim that death can’t touch him. Because death can touch Jesus. That’s what it means for him to share in our humanity. In the cross, death takes from Jesus the same things that it takes from us. It exacts the same cost: it exposes his weakness, lays bare his fears, and leaves him feeling helpless and utterly alone, feeling forsaken even by God. That’s how he serves God as a high priest, as a chaplain, on our behalf. By giving himself to the terrifying prospect of death, and letting it have its way with him. When you affirm your faith in that this Sunday morning, also affirm that he understands your suffering too. He understands your pain, your fear, and why you feel sometimes like they’re the only things that matter. But just as he shares your suffering and death, you will also share his resurrection and life. Just as surely as Sister Jean will be at that game tomorrow.